Step 1 Place chocolate in a large heatproof bowl; set aside. Step 2 In a medium saucepan, whisk together milk powder and cornstarch. Whisk in 1 cup (250 mL) of the milk until smooth; whisk in remaining milk. Heat over medium heat, whisking often, until slightly thickened and steaming hot, about 5 minutes (do not boil). Step 3 Pour milk mixture over chocolate; let stand for 30 seconds. Whisk until melted and smooth. Add vanilla and peppermint extract. Step 4 Pour into 4 mugs; sprinkle with shaved dark chocolate and serve with peppermint sticks or candy canes on the side for stirring. 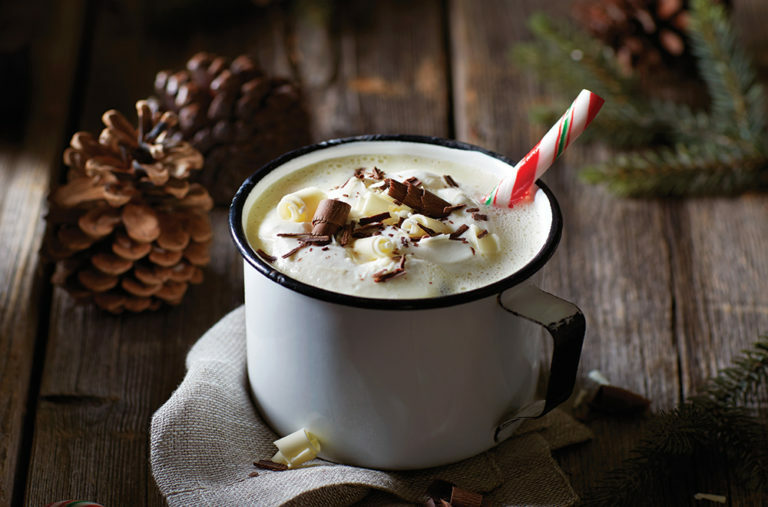 This holiday-inspired version of hot cocoa forgoes the usual cream or whole milk yet still tastes like an indulgent treat. It’s the addition of milk powder and cornstarch that creates a velvety, frothy texture! For extra minty notes, increase the peppermint extract to 1/4 tsp (1 mL).